Lilongwe, Malawi - December 3, 2018 - Aligning with MCA-M's Infrastructure Development Project, GE Power's Grid Solutions business today announced it has completed the installation and commissioning of the Energy Management (EMS) and telecommunications systems at 26 substations of the Electricity Supply Corporation of Malawi (ESCOM). The project, financed through the Millennium Challenge Corporation, will improve efficiency, reliability, security and planning of the transmission network in Malawi. The project will provide ESCOM with the tools to securely interconnect with neighboring countries (Mozambique, Zambia & Tanzania) and reduce technical losses in the transmission system in the medium-term whilst fostering economic growth in the long-term. At the handover ceremony Jeanne Hauch, Vice President and General Counsel, Millennium Challenge Corporation said, "The work we have accomplished through the MCC Malawi Compact has created the foundation for a modern power system in Malawi. The experience and expertise of partners such as GE are critical to the success of a compact. GE's technology is providing real-time and remotely managed information on Malawi's electrical grid and power outages. This kind of work has set the stage for Malawi's continued economic development." With about 3.2 million households without power, Malawi is working towards a reliable and cost efficient operation of its transmission system. "The ability to monitor the grid in real time is a key requirement to secure electricity supply nationwide. 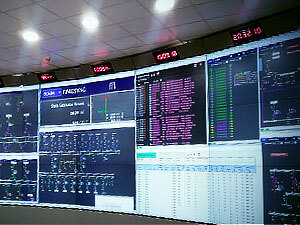 GE's EMS solution will enable the state-owned power utility to easily monitor, control and coordinate the related electrical networks, regulate power voltage within the transmission grid and identify system failure in those substations that are connected to the SCADA system," said Lazarus Angbazo, CEO, GE Power's Grid Solutions, Sub-Saharan Africa. "Furthermore, the grid modernization and expansion will enable safe and efficient transmission of electricity therefore providing more Malawians with access to electricity and pave the way toward development of Africa"s regional interconnections," he added. GE Power's Grid Solutions business provides complete, engineered solutions for high voltage (HV) substations to power generation companies, utilities, and industries, bringing together the right mix of high-voltage products through expert engineering and full project management. GE has designed and implemented over 1,700 substation projects in the last 10 years.